Let the silence of the desert change you; be captivated by the stunning shades of orange, pink and purple as the sun sets on the Erg Chebbi; and be mesmerised by the beauty of each city’s architecture on this incredible two for one package to Morocco. Experience the wonders of Casablanca, Rabat, Fez, Marrakech and more on this 14 day bucket list adventure. See Hassan II Mosque, the third largest in the world, which sits at the edge of the Atlantic Ocean on a tour of Casablanca. Discover Meknes on tour including the Bab el Khemis Gate and walk through the city’s spectacular centre. Be mesmerised by the mosaics and carved wood work in Medersa Bou Ananiya on a tour of Fez. Travel through the dramatic and diverse landscapes of the Middle Atlas Mountains en route to Merzouga at the foot of the Erg Chebbi dunes. Journey by camel back through the serene desert to a once in a lifetime Bedouin tent camping experience with music and food by the campfire. Discover the beautiful road of a Thousand Kasbahs, to the Dades and Rose Valley, and on to Marrakech, where you'll spend time at the world famous Jemaa el Fnaa and visit tombs and mosques on tour. This unforgettable package includes return international flights, 11 nights accommodation, 15 meals, return airport transfers and so much more. Have more time? Upgrade to the 19 day package with Canary Islands extension and enjoy five nights accommodation, return flights and 13 additional meals. 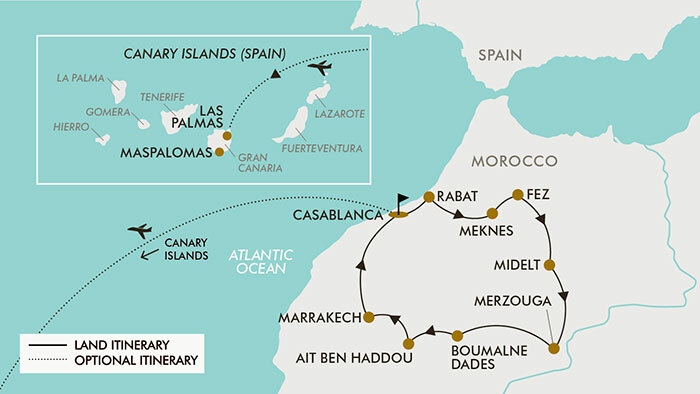 Today depart from either Sydney, Melbourne, Brisbane, *Adelaide or Perth for Casablanca, Morocco! Fly with Etihad Airways, Emirates, British Airways, Lufthansa or Swiss Airways to name a few (subject to availability). Upon arrival you will be met by a representative and transferred to the hotel. After breakfast enjoy a half day guided tour of Casablanca. See the famous Hassan II Mosque, (entrance not included) the largest mosque in Morocco and the third largest mosque in the world. It stands on a promontory looking out to the Atlantic Ocean. Explore the beautiful Ain Diab Corniche, a long promenade along the Atlantic lined with restaurants, swimming pools, Place des Nations Unies and the Habous Quarter. Afterwards drive north along the beautiful coastal road to Rabat, Morocco’s political capital built overlooking the sea. The city was established as the capital of modern Morocco during their independence. This afternoon enjoy a guided tour of the medina, seeing sights such as the Royal Palace (Mechouar), the Kasbah des Oudaias, originally a fortified town that is now infused with a distinctly Andalusian flavour, the Mausoleum of Mohammed V, and Hassan Tower (entrances not included). This morning depart to the imperial city of Meknes, where you will enjoy a guided tour of the major highlights. Sights include the old granaries of the Heri Es-Souani and the Museum of Moulay Ismail (entrance not included). You will also see the Bab el Khemis Gate and walk through the city’s spectacular centre to see Bab Mansour and Place el Hedim. Continue your journey this afternoon to Fez. One of the oldest of the imperial cities it has a rich fascinating history. It has played an important part in Moroccan trade, culture, religion and politics as well as being the seat of learning for science. After breakfast you will enjoy a full day guided tour of Fez, the intellectual and religious heart of Morocco. Fez has many mosques and medersas (theological colleges) including the ninth century Karouine University, whose architecture is very similar to that seen in Moorish Spain. See wonderful mosaics and carved woodwork in Medersa Bou Ananiya (entrance included), a group of buildings from the fourteenth century, which also include an elegant minaret overlooking Talaa Kebira. You also visit the famous medina in Fez, which is one of the largest in the world. In its immense and confusing warren of souks, there are thousands of artisans in their tiny shops opening onto the narrow alleyways. The medina of Fez is a totally absorbing and unique experience. Finally, your local guide will take you to the Jewish District (mellah), the Royal Palace and a panoramic viewpoint over the medina (entrance not included). Head south today and climb steadily into the dramatic landscapes of the Middle Atlas Mountains, through a magnificent cedar forest with the possibility to see some wild monkeys on the way. This is the land of the fiercely independent Berbers, the Lords of the Atlas, whose traditions and ways still hold sway up here in their mountain strongholds far away from the cities below. The Berbers present us with a unique view of a lifestyle lost from the rest of North Africa, music, dance, even language and religion. After crossing the High Atlas continue via Ziz Valley which is dotted with palm trees, fortified villages and Berber farming communities. Continue through the arid desert plains to Merzouga at the foot of the Erg Chebbi dunes. This morning enjoy a jeep safari around the dunes and meet with some local nomads. In the afternoon you will find your ‘ship of the desert’ waiting for you. Clamber onto the back of your camel and gently plod into the sand dunes like a true desert nomad. From dune to dune discover breathtaking scenery. The sensation of being surrounded by endless desert is incredibly calming and the silence is overwhelming. You will arrive at your camp of Bedouin tents, nestled in between the sand dunes. Walk along the rim of the sand dunes as the sun begins to set. Later this evening savour a traditional meal followed by music and dancing by the campfire. Early this morning climb back onto your camel and enjoy the magnificent sunrise on the golden dunes. After breakfast, continue your journey with a break at Rissani market. Then head towards Tinejdad where you will visit the Berber Museum of Khorbat. Opened in 2002, the Oasis Museum occupies a group of three restored houses inside the Ksar El Khorbat Oujdid, the Museum displays: antiquities and objects of traditional use, colour photographs, historic photographs, maps and sketches, scale models and reproductions. After the visit, enjoy a cup of tea inside a Kasbah. Continue towards the marvellous valley of Todgha with its ocher and green colours it’s one of the most beautiful valleys in southern Morocco. A lush green Tinghir oasis running along a deep valley inhabited by a Berber population in kasbahs and nicely designed villages. Walk along the palm groves and the gorge. In the afternoon, continue to the famous Dades Valley, known for its beautiful kasbahs and fortified villages. This evening you will stay in a kasbah in Boumalne Dades. Today you will discover the beautiful road of a Thousand Kasbahs, where each of the oasis towns can boast their own distinctive character. First head to the marvellous Dades and Rose Valley with their diversified coloured landscape. Then reach Ouarzazate, the city of cinema and continue to the UNESCO World Heritage Site of Ait Ben Haddou, which has been used as a backdrop for many Hollywood blockbusters, it was one of the important fortress strongholds on the old Salt Road Caravan Route, between the Sahara and Marrakech. After breakfast head north through parched desert sand where stone gives way to the hills and deep gorges of the High Atlas Mountains. Wind your way up and over the Tizi n' Tichka (2260m), the highest vehicular pass in Morocco and often snow covered during the winter months. Then head to Marrakech through spectacular scenery, colourful valleys, shepherds with their flocks and Berber villages high up on the hillsides. Upon arrival, you will be transferred to the hotel and then enjoy the rest of the day at leisure to do some sightseeing and perhaps discover the famous Jemaa el Fnaa square by night. Today set off on a half day guided tour to explore a city that has for centuries been a meeting place for the mountain Berbers and the desert people of the south. Marrakech is divided into two distinct parts, the Gueliz (the modern French-built city) and the Medina (the Old City). Start by the Koutoubia Mosque, the largest mosque in Marrakech, (entrance not included) famed for its minaret, which has inspired other buildings such as the Hassan Tower of Rabat. Next on the tour is a visit to the fascinating Saadian Tombs, which dates back to the time of Sultan Ahmed al-Mansur who reigned from 1578 to 1603. These remarkable tombs are renowned for their beauty, in particular their steles and stuccowork. Also visit the Bahia Palace and museum. Built to be the most impressive palace of its time, it captures the essence of both Islamic and Moroccan styles. Finish the tour with some free time in Jemaa el Fnaa, the famous market square, a maze of bustling bazaars, palaces and mosques. It’s worth seeing this renowned landmark in the evening, as Marrakech revolves around the open-air central square. With food stalls, snake charmers, water-sellers and acrobats, it’s a place of entertainment for both locals and tourists. This afternoon there is also the opportunity to join some optional tours including a horse drawn carriage ride and a cooking class (not included). After breakfast travel back to Casablanca and enjoy the rest of the day free at leisure to either relax or explore. Today you will be transferred to Casablanca Airport for your return flight back to Australia. Please note: if your flight departs early, breakfast will be arranged for pick up from the hotel reception the night before. Today you will be transferred to Casablanca Airport for your flight to Las Palmas, Gran Canaria Island, Spain. Upon arrival be met and transferred to the all inclusive hotel in either Maspalomas or Las Palmas. Enjoy the rest of the day at leisure on this beautiful island. Gran Canaria is one of Spain’s Canary Islands, off north western Africa. It's known for its black lava and white sand beaches. Maspalomas is a resort town in the south of Gran Canaria known for its vast expanse of coastal dunes. Las Palmas is known for duty-free shopping and for its sandy beaches. The distance between the 2 towns is 40 min and both are famous for their tourist attractions, subtropical climate, beautiful beaches, good restaurants and nightlife. Today enjoy the day to either explore or relax or take the opportunity to join an optional full day jeep safari tour with a local guide (not included). Drive along the scenic coast line through ravines to the mountains and then head inland through green valleys and lush tropical vegetation. You will reach Presa de las Niñas Reservoir a great spot surrounded by nature in the centre of Gran Canaria. Afterwards you will stop at a local café and have the opportunity to try a famous papaya juice typical of the area and some special bread (not included). Continue your journey through pines forests towards San Bartolomé de Tirajana to enjoy a traditional lunch (included). Next head to Fataga, a charming village with white houses and narrow lanes, all well-preserved and full of flowers, along with the surrounding valleys, pine forests and palm groves, one of the island’s beautiful spots. The tour ends with a visit to Playa del Inglés, “English Beach” before returning to the hotel. Today enjoy another spectacular day enjoying Gran Canaria Island either exploring the restaurants, shopping or relaxing on the beach – there is something to please everyone. Or you can take the opportunity to join an optional south coast discovery half day tour (not included). Enjoy your last day free at leisure on this beautiful island. Enjoy the morning at leisure before being transferred to the airport for your flight to Casablanca. Upon arrival be met by a representative and transferred to the hotel. Travel offer is valid for travel on selected dates until the 20th November 2019. Etihad Airways, Emirates, British Airways, Lufthansa, Swiss Airways, Austrian Airlines, Air France, KLM, Virgin Australia, Virgin Atlantic, Qatar Airways, Oman Air, Turkish Airlines plus any codeshare partners (subject to availability). Twin share: $900 for 2 people/one way. - Casablanca, Morocco: $100 per room including breakfast. Minimum group size 26, maximum group size 26 per vehicle. - Day 14: Full Day Jeep Safari: $110 per person. - The optional tour listed above must be purchased on checkout or over the phone prior to submitting your passenger information form (subject to availability). - Visa fees and requirements (A tourist visa for Morocco and the Canary Islands (Spain) is not a required for stay up to 90 days if travelling on an Australian passport). - Recommended gratuities/tipping: $4 USD per person/day. Morocco's climate is very diverse, varying with the season and region. The country is mostly dry with high temperatures in summer (June - August) and a cooler climate in the mountains. In spring and Autumn (September - November and March - May), the cities are warm to hot (maximum daytime temperatures around 25 - 30°C) with pleasantly cool nights. In the desert, the sun is strong and the nights can be cold. In the mountains, the air is cool and nights are cold. In winter January and February the temperature goes from 20°C in the daytime to 9°C at night. In Gran Canaria, a round-shaped island belonging to the Canaries, the climate is subtropical oceanic on the coast, that is, very mild and sunny most of the year, with mild and spring-like winters, and warm and sunny summers, and also with little rainfall, concentrated in the period from October to March. Along the coasts, and therefore also in the major cities, daytime temperatures are very mild in winter, with highs around 21°C in January and February, and warm in summer, with highs around 27/28°C from July to September. Please note: a standard level of fitness will be required. If you have any concerns please consult your healthcare provider prior to purchase/travel. Gratuities (tips) are not included in the tour price for services of the tour leader (when available) and driver throughout the tour. The recommended tip for the tour leader and driver is $4 USD per person per day, which will be collected whilst on tour. A tourist visa for Morocco and Canary Islands, Spain is not required for a stay of up to 90 days, if travelling on an Australian Passport.